Home » People » Faculty » Schweik, Charles M.
My research focus is on public sector information technology, environmental management and policy, and the intersection of these domains. More specifically, I am a social scientist working to understand Internet-based collective action and online commons-based peer production. Over the last decade, my research has focused largely on the study of open-source software communities, and the socio-technical systems and governance structures that support these systems of co-production. My book — now freely available in pdf form!!! 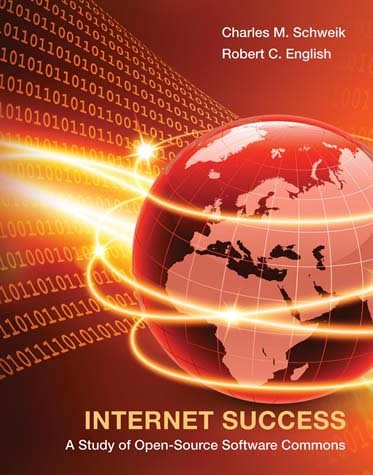 — Internet Success: A Study of Open Source Software Commons (MIT Press, 2012; click link to download) analyzed more than 170,000 such projects, in an effort to explain what leads some to ongoing collaborative success and many others to early abandonment. With this grounding in open source collaboration complete, my current list of projects (below) are expanding into other online peer-production settings that, in some way mimic or borrow collaborative principles from open source software. The “World Librarians” Program. In this project, the UMass Scholarly Communications office in the Du Bois library, my team of UMass graduate and undergraduate students and I are providing digital information to offline, very rural, schools, libraries and health clinics in Malawi. Importantly, the digital information we provide is not what we think they want and need, but are based on direct requests we get from these requesters in Malawi through Twitter messaging or an off-line email system called e-mule. We ship the information via Google Drive to our nonprofit partner in Malawi ShiftIT . For a short video of how the project works, see our Youtube video summary or this paper. UMassAir. I’m a co-founder of a new group on campus called “UMassAir” which is an interdisciplinary group of faculty, graduate and undergraduate students and staff working on research and education around unmanned aerial systems. I decided to get into this area when, in 2016, a student flew a quadcopter dangerously over our UMass football stadium. I realized that the genie is out of the bottle, and UMass has an obligation to teach students how to use these technologies safely, and legally, and be aware of issues such as security and privacy. Moreover, the remotely sensed data of the environment that can be acquired by these machines is unprecedented and a huge opportunity for environmental management and policy. Landcover Change in Massachusetts Salt Marshes using Unmanned Aerial Systems Remote Sensing. This is an EPA funded project, where my collaborators and I are flying many UAS-based aerial image gathering missions at five salt marsh locations in Eastern Masssachusetts, collecting multi-spectral landcover data. Our interest is to see if we can identify a spectral signature of salt marsh die-back. Commons-based peer production in geospatial science education. Here, I have focused effort around the international collective-action in the context of open source geospatial analysis. I am one of the co-founders of an international effort we call GeoForAll.org. This effort has well over 100 nodes all over the world, including the Geospatial Research and Education Workshop at UMass Amherst. The broader study of Commons-based Peer Production” and “Knowledge Commons.” What are Knowledge Commons? See the video I wrote with colleagues, co-produced with the International Association of the Study of Commons. I am a co-founder of the international research group called the “Workshop on Governing Knowledge Commons“. Founder, International Association of the Study of the Commons, World Commons Week. We launched this first ever global event in October 2018, that involved three components: (1) kickstarter in-person conferences in Washington D.C.; (2) Thirty-five local events on commons research and practice all over the world; and (3) 24 live webinars, one given at every noon hour in every time zone as the world turned, on October 12, 2018. The event was such a success that planning for the October 2019 one is now underway. Applications in Do-It-Together, Environmental Monitoring Technologies – Student Projects from an Interdisciplinary, Flipped, Service Learning, Makerspace Course. This paper describes our efforts to create a new, flipped, team-based learning course around the development and use of open source environmental monitoring hardware. This paper describes our efforts to build a university-community or 'town-gown' effort around educational outreach in the context of open source 'making'. Analyzes more than 170,000 such projects, in an effort to explain what leads some free/libre and open source software projects to ongoing collaborative success and many others to early abandonment.